The Tactical Innovations M110 Cannon Muzzle Brake is precision machined from aircraft aluminum and professionally anodized for maximum lightweight strength and durability. It completely eliminates any flash and directs muzzle gasses away from the shooter and at angles away from the target. The M110 Cannon Muzzle Brake screws on to your 1/2-28 TPI threaded target / bull / .920 / heavy barrel Ruger 10/22 rifle without the need for any special adapter or coupling. 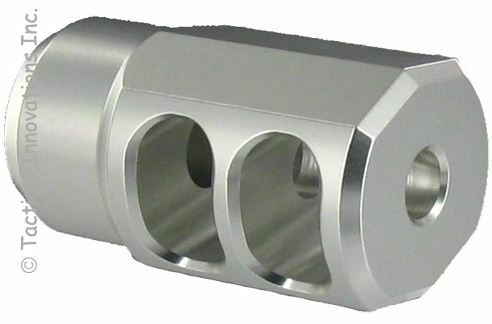 A peel washer (not included) may be used to index the brake and barrel thread timing to position the brake horizontally depending on the relative thread timing. .